This is another one of the the many models I have always intended to build, but just have never gotten around to it. Being a huge fan of the whole Peanuts gang, and particularly Snoopy the World War I ace, one of these flying doghouses would be a perfect project. I've never seen one configured for control line, so that's my plan when and if I ever do build one. Snoopy and the Red Baron have been dueling in the skies of comic strips for years, but only recently was it realized that Snoopy has been flying his doghouse without credentials - he never had officially won his wings. But Snoopy is a legitimate pilot now, thanks to Fred Williams of San Mateo, California. Fred is a member of the Peninsula Channel Commanders, an AMA chartered club. He's also a member of the Navy League, a longtime aviation buff, and a patriot. Fred believes that an individual can and should do his bit to make the world a better place to live in. He started with a simple idea that captured the imagination of everyone who heard it, soon involved hundreds of people, and got national attention. The idea was to honor the old-time virtues which have gotten lost in a generation and communications gap: honor, integrity, bravery, patriotism. Fred felt these were still strong enough to bring people together from all walks of life, young and old alike. Everybody loved Snoopy, he felt, and his creator - Charles Schulz - lived nearby. Why not a ceremony to honor them for their contributions to those ideals? 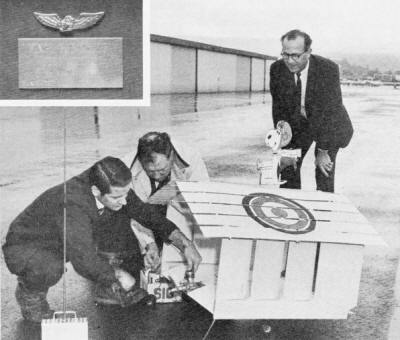 His RC flying Doghouse as famous to modelers as Snoopy is to readers of Charles Schulz' comic strip, Al Signorino, starting engine, assisted with festivities when the Navy Blue Angels presented Snoopy's wings. Assisting Al is AMA Executive Director John Worth. Fred Williams, who put forward the idea, looks on. Inset shows the gold wings crafted by Roger Tennyson. The inscription reads, "Wings for Snoopy: presented to Charles M. Schulz, San Mateo, Calif., March 12, 1969. Presented by Navy Blue Angels for Aviators Everywhere." One press release did the trick. In no time at all the whole country was involved and other AMA'ers joined with Fred to put the idea over. Another San Mateo modeler, Roger Tennyson, made the wings. Roger used his dentistry know-how and modeling techniques to design the wings and make a mold. He then cast and polished a magnificent set of genuine gold wings. Al Signorino, of the McDonnell-Douglas RC Club of St. Louis, also joined the effort. Al brought his famous radio-controlled doghouse to fly for the California press and television people, and to prove that Snoopy's flying was no mere figment of Schulz' imagination - he also provided a good example of the ingenuity, skill and resourcefulness of model flyers. It all came to a head on March 12. The wings presentation took place outdoors on the steps of the Hillsdale Inn in the late afternoon. About a thousand youngsters were on hand, as well as hundreds of adults representing almost every civic group and military installation in the area. The Navy's Blue Angels precision aerobatics team was featured, as was singer Jimmy Dean. Schulz, Dean and the Blue Angels signed autographs, and the Hamilton Air Force Band provided martial music while a trio of Stearman biplanes roared overhead. It was Memorial Day, July Fourth and Armistice Day all rolled into one, with speeches, flags and bunting. Most miraculous of all was the weather. Storms were all around the area all day, but for the two-hour afternoon program there was only sunshine at the Hillsdale. It wasn't that way earlier. Signorino and Worth got Snoopy in the air during morning rains at nearby San Carlos airport. Mud prevented use of the planned takeoff area so they used a well-puddled parking lot adjacent to the operations building. They fought wet and weak batteries, strange fuel and shifty winds. But finally Al got Snoopy to fly for the press and television cameras. Soaking wet, but triumphant, Signorino got Snoopy and his doghouse up and back to a pancake landing right in front of the cheering crowd. 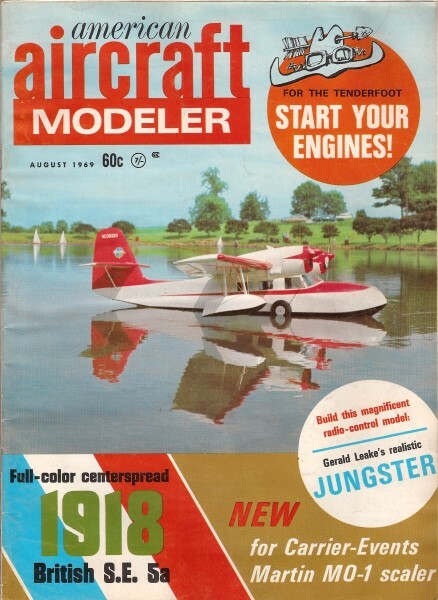 Worth then flew a tiny Fly-Navy AMA Cub which had a subminiature Snoopy aboard. Much more went on, including cocktail parties that night and a banquet at which TV star Barbara "Jeanie" Eden signed autographs, topped off by a late news television bit showing Snoopy's earlier flying. It was a wild windup to a spectacular day in which Snoopy and AMA shared the spotlight. The last we heard, Snoopy was gunning for the Red Baron again with a souped-up doghouse and a blinding flash of gold wings on his chest. If he hasn't crashed or retired by then, on July 20 he'll be flying for the crowd again in the Nats air show at Willow Grove Naval Air Station.